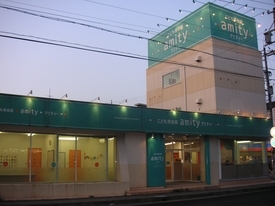 Gifu Amity is an English conversation school specialized in teaching children. It is 1 kilometer east from Gifu station. We have a reputation for high quality lessons with both Japanese and Native English teachers. Our motto is “educating children so they can speak English.” We have over 60 courses to choose from. Currently we have many students commuting from both within and around Gifu city. We have 8 teachers at Gifu Amity; 6 Japanese teachers and 2 Foreign teachers, all teaching a mixed assortment of lessons. The JR station not only offers quick and easy access to major destinations in Japan, but it is also a great source for cultural learning and shopping. The Nagaragawa River in Gifu is a great spot to visit. During the summer vistors can observe ukai from a boat along the river. The Senior High Course focuses on practical conversation and opinion forming. Students are encouraged to express themselves creatively and freely. The baby courses are a fun way to promote early learning. They are filled with exciting activities to keep both mommies and babies engaged. The lower level children's course is a great age group to teach. The students are eager to learn and to participate in many fun-learning activities. The Interactive Course seeks to make the student's English "come alive." Programs range from math and logic activities to story-based adventures.